Curry is a term referring to a number of dishes originating in the cuisine of the Indian subcontinent. The common feature is the use of complex combinations of spices or herbs, usually including fresh or dried hot chillies. The use of the term is generally limited to dishes prepared in a sauce. Curry dishes prepared in the southern states of India may be spiced with leaves from the curry tree. Spices are used both whole and ground; cooked or raw; and they may be added at different times during the cooking process to produce different results. The main spices found in most curry powders of the Indian subcontinent are coriander, cumin, and turmeric; a wide range of additional spices may be included depending on the geographic region and the foods being included (fish, lentils, red or white meat, rice, and vegetables). Curry powder, a commercially prepared mixture of spices, is largely a Western creation, dating to the 18th century. Such mixtures are commonly thought to have first been prepared by Indian merchants for sale to members of the British Colonial government and army returning to Britain. Curries may be either 'dry' or 'wet'. Dry curries are cooked with very little liquid which is allowed to evaporate, leaving the other ingredients coated with the spice mixture. Wet curries contain significant amounts of sauce or gravy based on yogurt, cream, coconut milk, coconut cream, legume purée, tomato purée, sautéed crushed onion or broth. 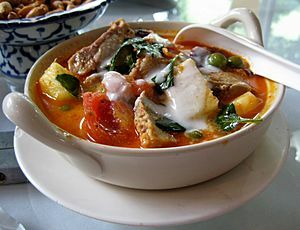 Curry was adopted and anglicised from the Tamil meaning "sauce", which is usually understood to mean vegetables and/or meat cooked with spices with or without a gravy. 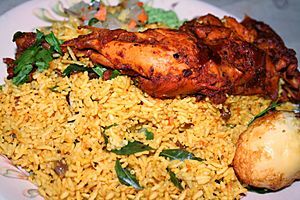 Cury (from French cuire, meaning to cook) appeared in the 1390s in an English cookbook, and kari was first described in a mid-17th century Portuguese cookbook by members of the British East India Company trading with Tamil (Indian) merchants. The first curry recipe in English was published in 1747 by Hannah Glasse. Archaeological evidence dating to 2600 BCE from Mohenjo-daro suggests the use of mortar and pestle to pound spices including mustard, fennel, cumin, and tamarind pods with which they flavoured food. Black pepper is native to South Asia and Southeast Asia and has been known to Indian cooking since at least 2000 BCE. 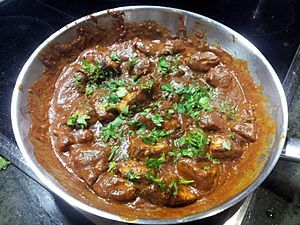 Curry was introduced to English cuisine starting with Anglo-Indian cooking in the 17th century as spicy sauces were added to bland boiled and cooked meats. Curry was first served in coffee houses in Britain from 1809, and has been increasingly popular in Great Britain, with major jumps in the 1940s and the 1970s. During the 19th century, curry was also carried to the Caribbean by Indian workers in the British sugar industry. 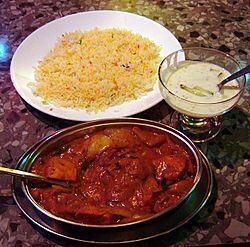 Since the mid-20th century, curries of many national styles have become popular far from their origins, and increasingly become part of international fusion cuisine. Bhuna – medium, thick sauce, some vegetables (bhunna in Urdu means "to be fried"). Biryani – spiced rice and meat cooked together and usually served with vegetable curry sauce. 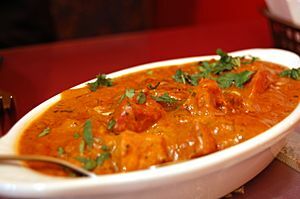 Curry – the most common name for a meat dish (most often chicken or lamb) with a medium-spicy, brown, gravy-like sauce. Dhansak – in the curry house, it may be made with either lamb or chicken and frequently contains pineapple, though this is not original. The name derives from a Parsi dish of mutton cooked with lentils (dal) and vegetables. Dupiaza/dopiaza – medium curry (the word means "double onion", referring to the boiled and fried onions used as its primary ingredient). Jalfrezi – onion, green chili and a thick sauce. Kofta – refers to dishes containing meatballs (most frequently lamb), or vegetable meat-substitutes (most often ground nuts). Korma/kurma – mild, yellow in colour, with almond and coconut powder. Madras curry – "the standard hot, slightly sour curry at the Indian restaurant." Naga curry – extremely hot dish with unique savoury taste made with the highly aromatic Naga Morich or Bhut Jolokia chilli pepper. Pathia – a hot curry, generally similar to a "Madras" with the addition of lemon juice and tomato purée. Phaal – "this is the hottest curry the restaurants can make. There is nothing like it in India — it is pure invention." Roghan josh – medium-spicy curry, usually of lamb, with a deep red sauce, tomatoes and paprika. It derives from a Kashmiri dish. Sambar – medium-heat, sour curry made with lentils and tamarind. Vindaloo – generally regarded as the classic "hot" restaurant curry. Progressively hotter versions are sometimes called "tindaloo" and "bindaloo". The tandoor was introduced into Britain in the 1960s, and tandoori and tikka chicken became popular dishes. Other dishes may feature with varying strengths, with those of north Indian origin, such as butter chicken, tending to be mild, and recipes from the south of India tending to be hotter. Curry powder is a spice mixture of widely varying composition developed by the British as a means of approximating the taste of Indian cuisine at home. Masala refers to spices, and this is the name given to the thick and pasty sauce based on a combination of spices with ghee (clarified butter), butter, palm oil or coconut milk. Most commercial curry powders available in Britain, the U.S. and Canada rely heavily on ground turmeric, in turn producing a very yellow sauce. Lesser ingredients in these Western yellow curry powders are often coriander, cumin, fenugreek, mustard, chili, black pepper and salt. By contrast, curry powders and curry pastes produced and consumed in India are extremely diverse; some red, some yellow, some brown; some with five spices and some with as many as 20 or more. Besides the previously mentioned spices, other commonly found spices in different curry powders in India are allspice, white pepper, ground mustard, ground ginger, cinnamon, roasted cumin, cloves, nutmeg, mace, green cardamom seeds or black cardamom pods, bay leaves and coriander seeds. Curry Facts for Kids. Kiddle Encyclopedia.